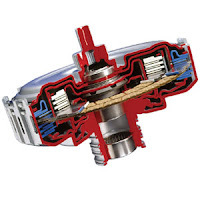 Engine output can be coupled to either of two transmission input shafts of an automated dual clutch transmission (DCT). Each clutch functions as both a launch clutch and a dynamic shifting clutch, enabling clutch-to-clutch shifts without torque interruption. The DCS design features tunable launch characteristics and scalable torque capacity in a modular design.